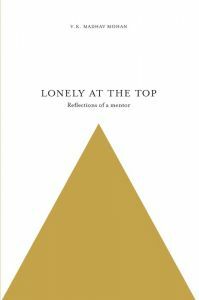 Lonely at the Top is about leaders and the challenges they face as they walk alone. This edited anthology contains the reflections of a seasoned Mentor, on the leadership dilemmas of the CEO in a turbulent and unpredictably changing world. With examples and experiences, the author indicates, sometimes subtly and at other times, forcefully, the tools, mindsets and approaches that enable leaders to steer their organizations safely through dangerous times. Many Indian CEOs also suffer from cultural schizophrenia, whether acknowledged or not - a crisis of identity stemming from the differing dialectics of modern Western business culture and India's own rich, philosophical heritage. Using real experiences as telling case studies, the book demonstrates the value of anchorage in the spiritual ethos of India, and especially in the ambrosial mentoring of Arjuna by Lord Krishna, on the eve of a primordial conflict that has much in common with the inner conflicts in the minds of today's decision-makers. What made me write this book? Leadership, I believe, is fundamental to all human progress; indeed, I'm convinced it is the ultimate driver of competitive advantage. It is leadership that creates the context, structure and milieu for interaction between people, which in turn results in innovation, profitability and growth. It is inevitable that the leader walks alone. Always treading the subtle boundaries between what is right, expedient, necessary and sustainable, the leader faces enormous stress. While mentoring super-achievers, I realized that loneliness is the one constant companion of leaders and change, unlike planning, cascades downwards from the top. But who is to bell the cat and impress upon the crème de la crème that they are the ones who must set personal examples? And how can leaders obtain inputs without seeming to be weak and unsure of themselves? Perhaps, sharing my experiences and observations will help. These case-stories and chapters can be read as stand-alone pieces or as part of broader themes. I hope they will encourage introspection, which I believe is a precondition for personal change. Leadership is exciting but painful and yet, help is always available for those who reach out. Madhav Mohan is a versatile composite of economics, management, banking, sports, martial arts and spirituality. A keen observer of organizations and people, and an out-of-the-box thinker, he believes in the infinite potential that resides within. Beginning as a tennis player he went on to earn three master's degrees in economics, management and international business. Having traversed the varied terrain of banking, entrepreneurship, IT, consulting, writing and lecturing, he evolved a mentoring practice 16 years ago. By marrying state-of-the-art management and leadership with the eternal precepts of Indian spiritual heritage, he offers potent solutions to people and organizations that are passionate about being the best they can be. by Nishit Lal is now a renowned speaker and trainer in the arena of Self Development and Achieving Peak Performances. Backed by professional degrees, B.Tech and MBA, he conducts entertaining yet powerful Life Skills seminars and Self Development workshops which empower people to make positive changes i... View More Nishit Lal is now a renowned speaker and trainer in the arena of Self Development and Achieving Peak Performances. Backed by professional degrees, B.Tech and MBA, he conducts entertaining yet powerful Life Skills seminars and Self Development workshops which empower people to make positive changes in their lives.